If you can spare 10 seconds a day, then this is for you. Trust me; it doesn’t get any easier than this. It all boils down to one single vitamin. This vitamin comes in different forms. Use too much of the wrong form of this vitamin and it can further suppress your thyroid function. We’ll get to that in just a second, but first you need to know what which vitamin I’m talking about and how powerful it is. The effect of vitamin A supplementation on thyroid function in premenopausal women. The rise in T3 thyroid hormone and fall in T4 thyroid hormone is oftentimes an indicator that the improvement in thyroid function resulted from an improved conversion of T4 to T3 in the liver. But, I also want you to keep in mind that the form of Vitamin A used in this research study was not the form of vitamin A you’ll find in most multi-vitamins or health food stores. When most people think of Vitamin A, they think of carrots. Carrots contain a rich source of beta-carotene which is one form of Vitamin A. And because it’s relatively inexpensive, you’ll find that beta-carotene is the form used in almost all multi-vitamins and other supplements out there. Yet, it’s important to understand that too much beta-carotene will actually suppress your thyroid. Beta-carotene itself is not a usable form of Vitamin A. Your liver has to convert beta-carotene into usable Vitamin A before your body can use. Dr. Broda Barnes also points out, this is why many hypothyroidism sufferers develop yellowish calluses or a yellowish pigment to their skin, which is common sign or symptom of hypothyroidism. My wife joked that I had an uncanny resemblance to an Oompa Loompa (from the movie, “Charlie and the Chocolate Factory”). With that being said, carrots should not be avoided entirely. In fact, I use them with clients for some very therapeutic purposes. However, large amounts of beta-carotene from the over-consumption of beta-carotene rich vegetables and carrot juice should be avoided. So, what kind of Vitamin A should you be using? The short answer is a “usable” form of vitamin A. In the study above, the researchers used retinyl palmitate which tends to work well for most and is what I formulated into our Vitamin ADK Thyroid Formula supplement. But, you still need to be careful with the other ingredients used in your Vitamin A supplement as well. For example, many Vitamin A or retinyl palmitate supplements are dissolved in some sort of PUFA (polyunsatured fatty acid) oil, which is well known for being very toxic to your thyroid. We avoid this common mistake by dissolving our Vitamin ADK Thyroid Formula in safe and protective coconut oil. It doesn’t make sense to try to solve one problem only to create a bigger problem for yourself in the process. While certain supplements can be very helpful with improving and restoring thyroid function, it’s important to understand that supplements are designed to “supplement” an already healthy diet. With that being said, you should never ignore the importance of your diet. 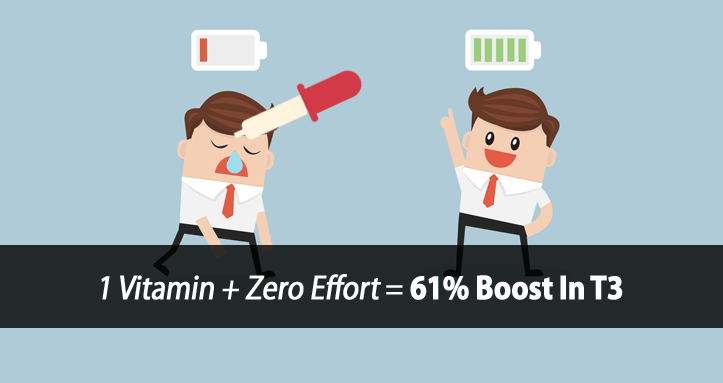 But, if you’re looking for an easy way to boost your thyroid with zero effort, then this is it. Thanks for the great info. I have a question relating to a previous article you wrote in which you said that hypothyroidism sufferers should eat a carrot a day to help detoxify the liver. Are you no longer recommending that? “With that being said, carrots should not be avoided entirely. In fact, we use them with clients for some very therapeutic purposes. Hi Tom, have made small changes to my diet but have been reluctant to follow the diet you have recommended. The idea of “diet” is something I have struggled with since my 20’s, i am now 56. In my early 40’s I was trying unsuccessfully to get pregnant and stay pregnant, even doing invitro 4x. After my second miscarriage I was tested for MTHFR and had it. I am wondering if you can add anything to help me understand how my diet can affect this condition. All I was told at the time was that I am at higher risk for stroke and heart attack. Other than being sure to increase folic acid nothing else was suggested. My am temperature is consistently around 96.4. I have read your book and it all makes sense and seems easy enough. I am currently working with a counselor regarding my weight (was 229, now 217 have kept it off since July). I am 5’7 and fairly active. I do Pilates 2x a week regularly and walk most days over 10,000 steps. I know I need to get more aerobic exercise and am waiting for cooler weather. (It is still in 90’s.) I need to just commit to your diet and see if it works for me. Help. Over-exercising will also only make your thyroid condition worse. Aerobic type exercise should be avoided. Quoting Dr. Schwarzbein… You don’t lose weight to get healthy. You get health to lose weight. I have Hashimotos but am not yet hypothyroid. I am 29 and was diagnosed after 6 months of trying to figure out what was wrong with me. My doctor (soon to be ex Endocronologist) seems to think hashimotos does not cause symptoms and there is nothing to treat or diet to change until you become hypothyroid. Do you know if your suggestions for hypothyroid diet apply to hashimotos and/or is there something else hashimotos patients should be doing to help delay hypothyroidism? Hashimoto’s is the most common cause of hypothyroidism today. There are a few issues with Hashimoto’s that need to be addressed. There’s an issue of metabolic dysfunction that occurs with hypothyroidism where your cells end up taking up excessive calcium and estrogen becomes excessive. The estrogen blocks the proteolytic enzymes that allow the thyroid gland to release its thyroid hormone, driving the hypothyroid aspect. Estrogen and stress hormone are both well known for causing involution or damage to the thymus gland. The thymus gland sits right behind your breast bone and regulates your immune system. So, damage to the thymus gland affects immune function. Studies have also shown that elevated estrogen increases the production of autoimmune antibodies. Regulating estrogen and stress hormone are two big pieces of the puzzle, but there is more to it than just that. Much of what we teach directly applies. However, this is something that we cover in detail in our HR Program. All of this article addressed pre-menopausal women. What about post-menopausal? Hi Charlene, the actions of vitamin A are the same independent of age. One could argue that vitamin A is more important for post-menopausal women. I was going to buy it but cannot because of the coconut oil. I am deathly allergic to coconut and anything derived from it, like sodium lauryl sulfate, used in toothpaste and shampoos. So, taking into consideration the need to avoid too much beta carotene- how much is too much? I eat a lot eggs and also use spirulina and chlorella., along with the carrot salad recipe you suggest. Hi Bob, it depends on vitamin A status, thyroid function, and liver function. If you notice orangish/yellowish calluses on the hands and feet, this is one indicator. If you’re concerned, you can also wash the grated carrot to help remove more of the beta-carotene. But for most, a carrot or two daily is fine. I have high homeocystiene – I also have MTHFR – I also have high b12 (double the high range max) I think this may be due to klebsiella over growth I suffer from but dealing with eradicating. My question is – does methyl folate play a role here ? Should one be supplementing with this? Hi Kim, for those with MTHFR or methylation issues in general (often due to hypothyroidism), then methylated folate can help. Also, you have to be careful with the B12 as studies have shown elevated B12 increases cancer risk significantly. Thank you for your prompt reply. Also curious do you feel balancing gut health and optimizing defecinecis one can optimize thyroid health without leaning into taking Meds? Hi Kim, as in the case of the study mentioned, I think it’s possible in some situation such as sublinical hypothyroidism. However, it really depends on a number of factors. Is there any correlation with the drug Accutane and hypothyroidism. It is a type of vitamin A. My sister and I both were on it as teenagers and now both are hypo thyroid. Makes me wonder. Hi Cameron, Accutane is a very high dose vitamin A. Very large doses without adequate thyroid hormone (T3) can suppress thyroid function. Is the chicken liver is good source of vitamin a I mean good one? Hi Sandeep, yes, liver is a great source of vitamin A, and other nutrients. If you take levothryoxine, can you supplement with your vit ADK formula? Hi Cindy, of course. It would be very beneficial. Hello, thank you for your advice which gives us a lot of interesting information. With regards to the carrots though I am not convinced. My experience is different and reading about this in Dr Walker’s book has encouraged me to use carrot juice as much as I like. I drank a lot for years. I turned yellow for a while. Then again when an amalgam filling was taken out, the liver needed to detox. After some time, when the liver became cleaner, the yellow skin left and never came back. I am still drinking a lot – for 4 years now. It makes me feel good, refreshed. So, this article reflects what my doctor GP told me as well, but in my experience it was different and more in line with what Dr Walker says, we turn yellow because this highlights how many toxins are in the liver. It means the liver has started a necessary cleansing process. When that has happened, the yellow leaves. I did extra liver detox to help it according to the Gerson therapy. I am only talking from my own experience though and that was impressive. hi tom,i have hashimotos,and am hypothyroid,my folate levels on my blood test came back as high on the spectrum, was wondering why this was so i asked my docter and she said its because i eat healthily,im confused because i read up that it is bad to have too much folate,and my body is not exreating it like it should,i also was tested to having medium fatty liver disease,please could you give me some advice. Hi Angela, unfortunately a lot more information would be required to provide an adequate response. Can collagen hydrolysate protein delivered be used also by person with celiac diaease and lactose problem? Hi Pavle, Yes it actually would be recommended for a number of reasons. The collagen protein powder we use is 100% pure and contains no other ingredients, fillers, gluten, lactose, etc. Hi! Is cod liver oil a good resource fof vitamin A? Hi Johanna, no, it’s not one I recommend due to the polyunsaturated fat. I have been following your website for sometime now. I have hypothyroidism and am on 100 Mcg of thyroxin everyday. I do suffer from lack of sleep, palpitations, very dry skin, weak nails, weak hair . I do not loose weight no matter how healthy I eat and walk a lot. I am a teacher by profession which requires a lot of energy. I get too tired by the end of school day. Do you think that your vit ADK will help. I am allergic to eggs and but am non vegetarian. Kindly suggest what all vitamins to take and how? Hi Kuldeep, the sleep issues and palpitations are directly caused by elevated adrenaline, which is how your body is compensating for your hypothyroidism. 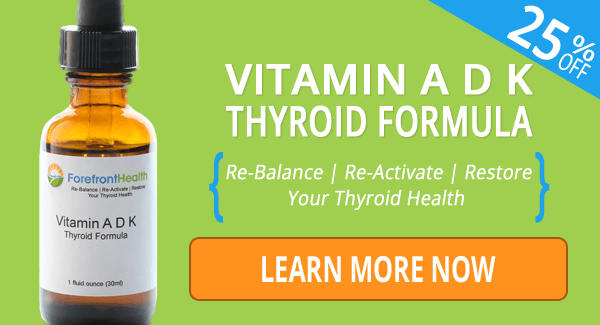 The Vitamin ADK Thyroid Formula is one of many things that can help. I am confused, I started eating one or two carrots a day, as you said in a previous article it was good for estrogen dominance. i am in perimenopause and have hypothyroidism. Should I continue to eat them? Hi Anne, yes we use the carrot for the special fiber therapeutically. One to two carrots daily should be OK for most. You can always keep an eye on your calluses, palms of hands, soles of feet for signs of yellowish/orange-ish color, which is a sign of carotenemia. Carrot juice and using lots of high-carotene vegetables should be avoided. Hi Tom, is canned Cod liver OK sometimes? Also your v-A is palmitate, but retinol or retinyl? Sure you know the difference. Hi Tom, I just got the Vitamin A D K thyroid formula. WHen is the best time to take this for best results? Hi Sandy, best to take it with food, 3 times daily as per the instructions on the bottle. Hope this helps. I used 25 MCG T3 months ago on its own with way better results. Looking into why….Seems T3 doesn’t work at a cell level without cortisol , vitamin a & d. How much vitamin a would you think at that dose of thyroid? I see the dose is 5 drops. Once a day? Any particular time of day? Hi Jeanne, are you referring to our Vitamin ADK Thyroid Formula? The correct dosage is 7 drops, three times a day. It’s best taken with food. Thanks for your reply—I finally got around to ordering the ADK formula. Three times a day seems like a lot—but I’ll give it a try. Couldn’t you just make it stronger?